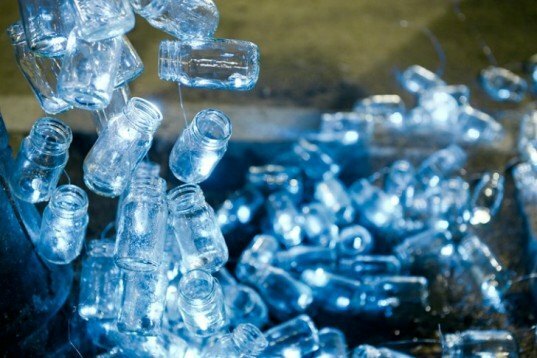 Spanish art collective Luzinterruptus recently staged a stunning installation of recycled glass containers cascading from dismantled public fountains in the streets of Madrid. 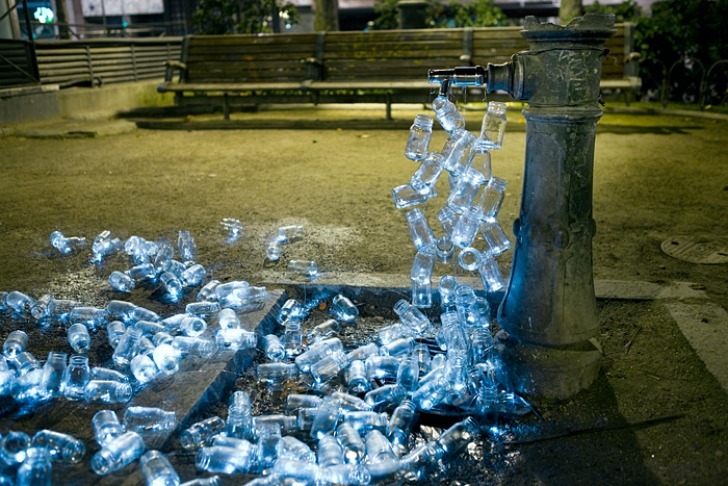 The glowing public work of art is an intervention - it's intended not only to look beautiful, but to bring attention to the lack of water facilities in public spaces in the Spanish city. Over the last 30 years more than 50% of Madrid’s public water fountains have been dismantled. Luzinterruptus‘ latest intervention, dubbed “Drinking Water Running Through the Streets”, uses the public space as a site to criticize the administration and demand action. The group has collected over 200 glass vials that previously contained the Infantrini multiple vitamin supplement. After spending four months slowly gathering up the used vessels, Luzinterruptus cleaned and transformed into a luminous installation that sheds light on a public infrastructure problem. Luzinterruptus' latest intervention is dubbed "Drinking water running through the streets". Over the last 30 years more than 50% of Madrid's public water fountains have been dismantled. The group uses public space as a site to criticize the administration and demand action. The group have collected over 200 glass vials that previously contained the multiple vitamin supplement Infantrini. They spent four months slowly gathering up and cleaning the vessels. Luzinterruptus transformed the containers into this dynamic work, lighting up the dark streets.